Since 1996, five JIRP students each summer have been the beneficiaries of financial support from the National Aeronautical and Space Administration (NASA) Alaska Space Grant Program. 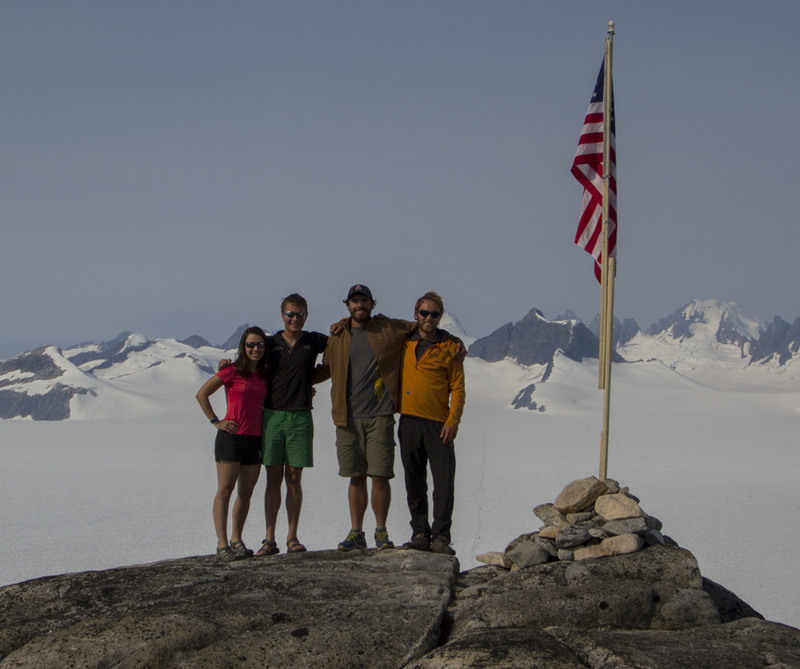 The 2013 NASA Alaska Space Grant awardees are (from left to right) Jamie Bradshaw, Grayson Carlile, Patrick Englehardt, and Jonathan Doty. Not pictured: Sarah Mellies. Photo by Adam Taylor. The Alaska Space Grant Program (ASGP) is a consortium of public and private Alaska universities and non-profit organizations that sponsors a broad range of programs to enhance teaching, research, and educational outreach within aerospace and earth science, and other NASA related STEM disciplines throughout Alaska. The ASGP was established at the University of Alaska Fairbanks in 1991 under a Phase II Program Grant from NASA's National Space Grant College and Fellowship Program. Through ASG’s Higher Education Program, I have applied for and secured summer funds to support students as they experience the glacier and earth science that occurs through JIRP. As UAS Affiliate Space Grant Director as well as a board member of the Foundation for Glacier and Environmental Research (FGER, the nonprofit organization that supports JIRP), I have been able to support over 70 undergraduate students in their JIRP experience, so critical to training the U.S.’s future climate scientists. JIRP recipients of this award have been able to fulfill the goal of the ASG’s Higher Education Program to contribute to the development of the science, technology, engineering, and mathematics (STEM) workforce in disciplines needed to achieve NASA's strategic goals. Jamie Bradshaw, Grayson Carlile, Jonathan Doty, Patrick Englehart, and Sarah Mellies. Previous NASA-JIRP awardees are now well into their successful professional careers as glaciologists, chemists, hydrologists, geodynamicists, engineers, and climate researchers. They include Dr. Shad O’Neel 1996 (USGS Glaciologist and FGER Board), Dr. Erin Whitney 1996 (Chemist-National Renewable Energy Lab), Dr. Joan Ramage 1997 (Associate Professor of Remote Sensing, Lehigh University), Hiram Henry 1998 (Alaska Department of Transportation), Matt Beedle 1999 (Doctoral Candidate, University of Northern British Columbia, FGER Board), Eleanor Boyce 2001 (UNAVCO), and Seth Campbell 2007 (Doctoral Candidate, University Maine).